The five-member band Calan opens Lawrence University’s 2017-18 World Music Series Monday, Sept 18 with its vibrant version of traditional Welsh music. The concert is at 8 p.m. in Stansbury Theatre of the Music-Drama Center. Tickets, at $10 for adults, $5 for seniors/students, are available through the Lawrence Box Office, 920-832-6749, or online. Eye-catching clothes and a presentation to match reinforce Calan’s vision of itself as a new generation of Welsh musical ambassadors. 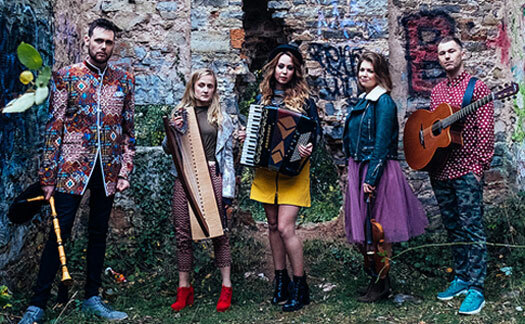 Blending fiddles, guitar, accordion, harp and a traditional pibgorn into sparkling melodies and spirited performances of Welsh step dancing, Calan blasts its way through old favorite reels, jigs and hornpipes with fast-paced, uplifting arrangements. Calan released its debut album “Bling” in 2008 to critical acclaim. It generated large audiences and rave reviews at concerts and festivals throughout Britain and Europe, including the coveted Cambridge Festival. They were honored with the Best Group Award at the 2008 Festival Interceltique de Lorient in France. 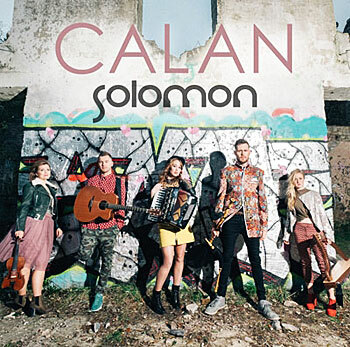 Since “Bling,” Calan has released three more albums, including 2017’s “Solomon,” a 12-track record that mixes traditional acoustic folk with bumping beats and pounding rhythms. Accordion player Bethan Rhiannon, who sings in both English and Welsh, is a national clog dancing competition champion who often displays her award-winning step-dancing. Rhiannon is joined by Patrick Rimes, a former three-time junior Celtic Welsh fiddle champion who counts the Welsh bagpipes among the multiple instruments he plays; fiddle player Angharad Jenkins, daughter of noted Welsh poet Nigel Jenkins; guitarist Sam Humphreys, a converted rock and electronic music performer; and harpist Alice French who specializes in traditional harp methods used by the Romani Gypsies of Wales.